Don’t just go shopping, go to town! Welcome to the Broadmead website – your guide to a unique experience shopping right in the heart of Bristol. Broadmead is not just a shopping centre, it’s a city centre – and because the city is historic Bristol, the experience is unforgettable. Here, a fascinating past combines beautifully with an exciting future. Among the things to see and do you’ll find over 300 stores, and a wide range of cafes, restaurants, clubs, pubs and other entertainments (see them here). 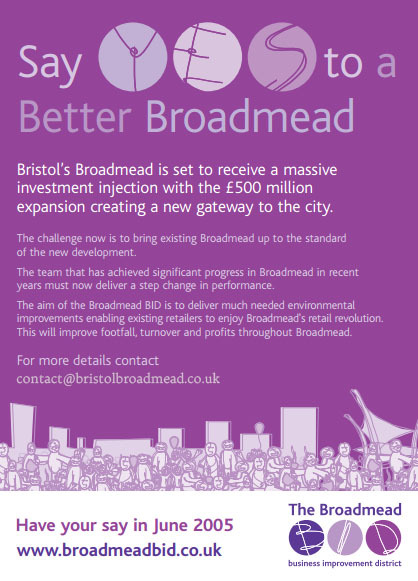 And bristolbroadmead.co.uk is your guide to what to see, where to go, how to get there, where to park – right down to a complete guide to what’s happening in and around Broadmead over the next few months. So, next time you need anything, don’t just settle for a traditional shopping centre. Treat yourself to a much more enjoyable experience – and go to town instead! The development, which is due for completion in Autumn 2008, will provide around one million sq ft of high quality retail and leisure uses, as well as apartments, offices and public spaces in the heart of Bristol. Bristol City Centre Expansion is being undertaken by the Bristol Alliance, a partnership between two of the UK’s leading property companies, Land Securities and Hammerson. In addition, the historic buildings at Quakers Friars will become the centrepiece of a new European style piazza, featuring apartments, shops, restaurants and cafes. If you cannot find the information you require on this website, please do not hesitate to write to us at: contact@bristolbroadmead.co.uk. EXCLUSIVE OFFER FROM SPECSAVERS – FREE CAR PARKING!